The Valley of the Kings, otherwise known as Biban el Muluk, is situated about two miles inland from the edge of the valley. A tarmac road makes the distance seem short. Before its construction a visitor had a sense of the arid remoteness of the site chosen by the Pharaohs of the 18th, 19th and 20th Dynasties for their tombs. There are over sixty in the valley. The Pharaohs of the New Kingdom, as already explained, chose to separate their tombs from their mortuary temples as a safeguard against pillage, and to burrow through solid rock in an effort to ensure eternal seclusion. The actual tomb design was relatively uniform, differing only in length and in the number of chambers. There were usually three corridors, one following the other, leading to the inner chambers. High up on the walls of the second corridor were sometimes oblong recesses for the reception of the furniture and effects of the deceased. Alternatively other recesses or chambers were provided at the end of the third corridor for the same purpose. At the end of the third corridor was a door leading to an antechamber; the main hall or tomb chamber lay beyond. The roof of the tomb chamber was often supported by pillars and small chambers led off it. In the centre or to the rear was a crypt containing the sarcophagus, usually of red sandstone. A shaft, sometimes dropping to a depth of over six metres, was a feature of several tombs. Whether this was designed to discourage possible grave-robbers from proceeding further is not sure, though there are positive indications that this was their purpose; for example, the representations on the upper walls of the pit shaft were usually left unfinished with the outer frame of decoration missing, whereas the chambers beyond the shaft were fully decorated. Another theory is that the shaft was for the drainage of rain water through rain is not common in Egypt the tomb designers may well have taken precautions against the possibility of seepage. The concern of the Pharaoh was not with his death, which was inevitable, but that his journey to the hereafter should be as smooth as possible. There was no apprehension, no fear. Man continued life after death in much the same manner as he had lived on earth, so long as the necessities for his existence were provided, safeguards were taken to prevent his body from decay, and the religious formulae were scrupulously followed. In the Middle Kingdom the religious formulae by which the dead were to triumph had been recorded both inside and outside the sarcophagus. Gradually the texts were elaborated and scrolls of papyrus were placed in the coffin as well. Enlarged over the years these gradually became uniform and the nucleus of what has become known as the Book of the Dead. The rock-hewn passages and chambers represent stages in the journey to the underworld, which was supposedly divided into twelve hours or caverns. The deceased sailed through them at night in the boat of the Sun-god in fact actually absorbed by him and representations on the first corridors of the tombs often show the ram-headed Sun-god surrounded by his retinue who are standing in a boat and temporarily bringing light to the places he traverses. As they pass from one leg of the journey to another they have to go through massive gates, each guarded by huge serpents. These chapters of the formula are know as the Book of the Gates. The forward corridors were generally devoted to Praises of Ra hymns to be sung and illustrations of the ceremonies to be performed before the statue of the deceased Pharaoh to imbue it with eternal life. And finally the deceased reached the judgment seat of Osiris, King of the Underworld. Isis, the myth continues, raised her son Horus in the marshes until he was strong enough to avenge his father’s death by slaying Set. He then set out to seek his father and raise him from the dead. The risen Osiris, however, could no longer reign in the kingdom on earth and now became king of the underworld where, with Isis still at his side, he ruled below with the same justice as he had exercised above. Horus took over the throne of his father on earth. The tombs in the Valley of the Kings, which are guidebooks to the hereafter, give us an insight into the hopes, expectations and fears of the living Pharaoh. Very soon after his coronation he must have ordered the construction of these usually vast complexes. His artists made initial sketches on the walls. His artisans began to turn out the 403 Shawbti (little statues bearing the implements of labour and usually put in big wooden boxes in the tomb to save the Pharaoh from tedious work in the hereafter). Funerary furniture was designed and made. 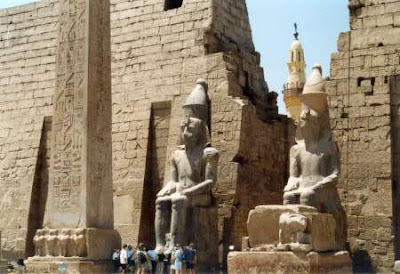 And since secrecy was vital, only the workers from the city at Deir el Medina (pages 70/71) toiled on the tombs and only the Pharaoh himself and the high priests knew the actual site. It is probable that the priests actually possessed an architectural plan or blueprint for the construction of tombs in the valley. Though none has ever been found, one cannot believe that a people capable of placing an obelisk of solid granite upright on a small rectangular base, of planning irrigation canals, and, with their obsession for accuracy, of dividing the year nearly 4000 years B.C. into 365 days and thus forming the basis of the calendar we use / today, that such a people would hazard a guess about that most vital decision: where to dig a Pharaoh’s tomb. Admittedly the first corridor of the tomb of Ramses III actually breaks through into another tomb that of Amenmesse, one of the pretenders to the throne at the end of the 19th Dynasty and is consequently diverted and continued to the right. While this might indicate the absence of any blueprint it may equally be the exception that proves the rule. What a sad turn of fate that, despite the remoteness of the site, enforced secrecy, complexity of structure and diversion shafts, the tombs were robbed from earliest times! In fact they were probably penetrated soon after they were sealed.